In 2017, Steward Baylor Jr. is a contender for wins in all three of the series he competes. Photo: Shan Moore. Steward Baylor Jr. has been on a tear in 2017. 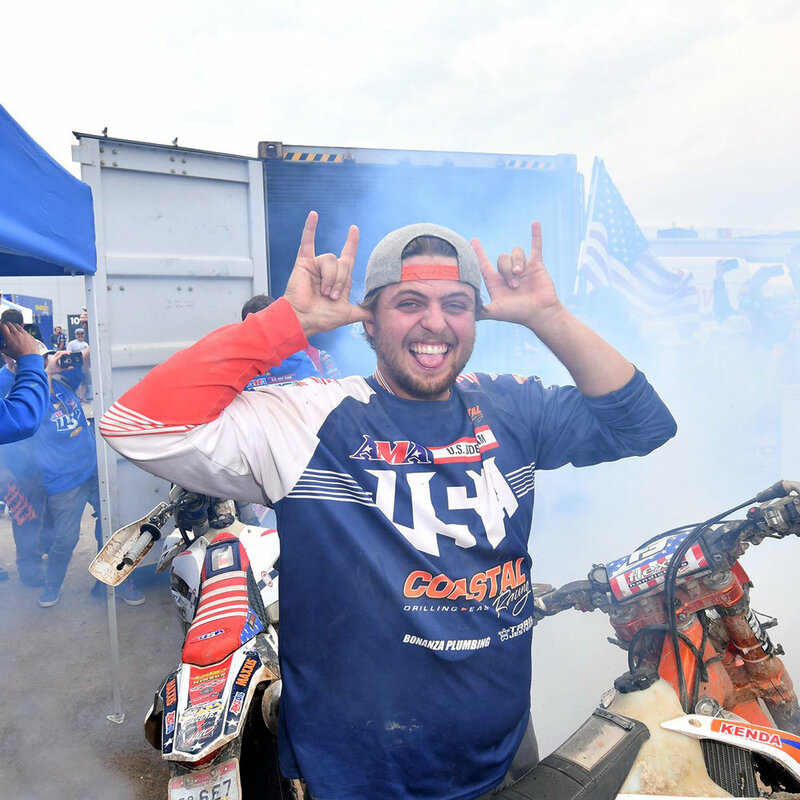 After an up and down couple of years plagued by injuries, in 2017 Baylor is a contender in all three of the series he’s competing: National Enduro, Full Gas Sprint Enduro, and GNCC. In all three he’s taken a win—and in all three he’s been consistently on the podium. What has changed with Steward Baylor Jr. in 2017? We decided to ask him that question and more in our exclusive Dirt Buzz interview. Dirt Buzz: Steward, you’ve been on a roll this year in all three of the series you are racing. Is there something in the water down there in your neck of the woods or did you make some changes to your program coming into 2017? Steward Baylor Jr.: This year I made some changes, nothing too drastic but spent a little more time trying to finesse my riding on the bike to eliminate mistakes that have kept me injured the last few years. After that, I've started working with Full Gas Fitness to do my off-the-bike training, it's not that I'm training any harder than I ever had, I've just again tried to eliminate doing things that aren't needed in my training. I’m "training smarter, not harder." "... it's not that I'm training any harder than I ever had, I've just tried to eliminate doing things that aren't needed in my training. I’m 'training smarter, not harder.'" – Steward Baylor Jr.
DB: Speaking of something in the water, you recently ended up in the hospital with low blood pressure and a high body temperature that was attributed to a bacterial infection that was likely picked up in water somewhere. Sounds like a pretty scary thing to go through. SBJ: Well, I think it was from the water but the doctors don't really know how you pick up a lot of infectious diseases. My immune system was low and I just picked something up. I felt the signs before the race started but I've never quit and didn't intend on starting that day. That is until I collapsed off the bike. Luckily someone helped me back on the bike and got me pointed to the pits. After that I don't remember much. Since then I've really been trying to get back to where I was—but I'm really struggling. I'm making a more mistakes on the bike which has cost me a lot of points recently after a crash that resulted in a broken rib that I didn't know about until the following week. Baylor attributes sprint enduro as a series that's helped increase his intensity and ability to use speed to catch up when needed. Photo: Joyce Riddle. DB: Needless to say, you’ll probably be staying on the boat when you go fishing or out on the lake for a while? SBJ: Definitely not staying on the boat in the water! Although the doctors said I shouldn't be in the water they also advised I not race for eight weeks. I'm not one to live in fear of what might happen. DB: At the moment, you are one of the few top-level riders competing full-time in the National Enduro, Full Gas, and GNCC series. Other riders have either pulled out completely, or are only allowed to race a partial schedule. What are your thoughts on that? SBJ: I really enjoy racing all three series. I think that each series plays a huge role in the other series and anytime you can better yourself in a place you struggle (mine being sprint enduro) it helps you everywhere else. Picking up the sprint enduro series has really helped my intensity when I need to use my speed to catch up, which has happened almost all year in the GNCCs where I have been by myself and still running the laps of the fastest guys on the track in a heated battle. DB: Would you say you are “in it to win it” in all three series? Or is there an order of importance for you as far as which series has the most focus? SBJ: Obviously now my best shot is the National Enduro and [Full Gas] Sprint Enduro series, but I will not be giving up at the GNCCs. There is always a shot and I line up every weekend to win, sometimes I can't but it’s always the goal. Winning the National Enduro Series and/or Full Gas Sprint Enduro series is Baylor's main focus in 2017. Photo: Shane Moore. DB: So, we have to know, what’s the story behind the post-race ice cream ritual? DB: You won your first GNCC title back in 2011, then you followed that up the next year by winning the National Enduro title. After that were a tough few years with injuries. This year the Steward Baylor of those title years seems to be back and we can tell that you’re hungry for a championship by the way you’re riding. Is that the case? SBJ: I've always been hungry to win, it was just really tough when I made such good friends with my orthopedic surgeon. [laughs] I just couldn't seem to stay healthy long enough to compete. This year I've learned to work with my injuries and everything has just come back around. DB: Family has played a huge role in your program for you and your brother Grant since you began racing minibikes back in the day. Is your family still a part of your program that keeps you on track? SBJ: Yeah definitely. My dad still helps me on the practice bikes and sprint bike, and he's also at all the GNCCs with pit boards and pointing lines. Although I moved out of the house I still spend a lot of time back at my dad’s on the same corner tracks that we spent so much time on years ago! 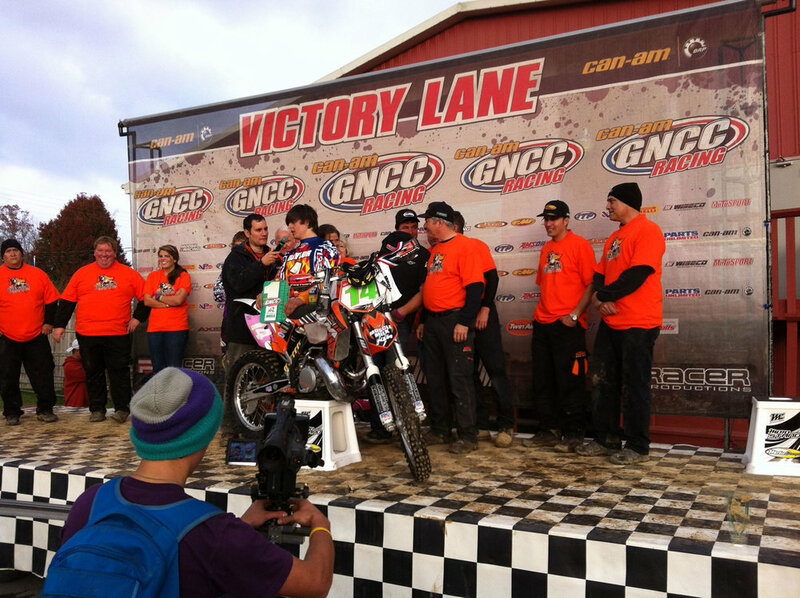 Baylor won his first pro title back in 2011 when he clinched the GNCC XC2 title. Photo: Dirt Buzz. DB: You are known as a rider with a high tolerance for pain. Through the years you’ve ridden through some tough injuries that would have sidelined most riders—such as a broken wrist and fractured collarbone. Injuries are a tough thing to know how to deal with. In hindsight, do think it was the right decision to ride through some of those injuries? Meaning, do think it hurt or hampered your career? SBJ: Honestly, there are times over the years that I wish I would have tried something different but at the same time I don't know what the outcome would have been and it could have been worse. I can't look back with any regrets, I'm comfortable where I am and really looking back now there is nothing I would change—I had a good time racing! DB: In 2014, you were a member of the winning ISDE Junior World Championship Trophy Team and you were also part of the team in 2015 and 2016. This year will be the first time in quite a few years you won’t heading to ISDE for the Junior team. Do you wish you could have been part of the U.S. World Trophy team this year? Or will it be nice to take a break from that event and potentially come back in 2018? SBJ: I could have stayed on the Junior Trophy team this year, although it was never the plan. ISDE is fun and I've had a great time going the last few years. This year I was one of the first selected for the World Trophy team but it was my decision not to go. At the time I was asked, I weighed the options of what I had to lose racing back in the USA (where I pay the bills). For me, I make no money racing overseas and with how successful I've been this year I couldn't imagine going over there and injuring myself and taking myself out before the end of my "comeback season." I've been on one-year deals and trying to get back where I was for five years, [and] with a house payment now, I really needed to think more about the bigger picture. Baylor was a part of the winning ISDE Junior World Championship Trophy team in 2014, and also member of the team in 2015 and 2016. Photo: Art Pepin. DB: You have a reputation as a rider that’s not scared to try things and “just send it.” We’ve seen some pretty crazy videos throughout the years that end up going viral on social media, and as a result you’re a fan favorite. Is this all part of the Steward Baylor Jr. master plan? Or is this just who Steward Baylor Jr. is in real life? SBJ: I love life. I'm not the Ryan Dungey of racing and I never will be. I plan to live life how I want without being restricted by racing as so many riders are. I will "send it," I will drink a few beers and have a good time, and talk a little smack. It's just the way I like to live and although some may look down on it at least I'm living my life to the fullest and having a great time doing it. "I love life. I'm not the Ryan Dungey of racing and I never will be. I plan to live life how I want without being restricted by racing as so many riders are." – Steward Baylor Jr.
DB: With you turning pro at such a young age it seems like you’ve racing forever yet you’re only 23 years old, which means you have a lot of years ahead of you. What are your short-term goals over the next few years as well as your long-term goals down the road? SBJ: As of right now the plan is to race for the next few years and get a good enough reputation as well as enough money to start an off-road training facility. It's been a goal of mine since I started doing a few schools six years ago. I enjoy teaching and working with the youth of our sport, it's just something I can see myself doing and enjoying. DB: It’s an off weekend with no races going on, what’s your favorite thing to do to relax? SBJ: I'm taking the boat out, drinking a few cold ones, wake surfing and hanging out with a few buddies. Look for a Steward Baylor Jr. off-road training facility in the near future. Photo: Shane Moore. DB: We follow you on Spotify and notice you have a pretty eclectic taste in music. You bounce between country, hip-hop and classic rock to name a few genres. Would you say you like all forms music in general or is there is a go-to type of music you always come back to? SBJ: Being from the south I would have to say country is my favorite but I keep it open to everything. I enjoy all music, it just depends on the day. While we are on the lake it's mostly rap, before a race it's punk rock or rock, but I also enjoy classic rock while driving. DB: This may be a tough question: fast-forward to the year 2037. Where are you and what are you up to in life? SBJ: Well, honestly a training facility is my biggest goal but I never know what life holds from one minute to the next. If it isn't that I will be operating equipment, which is something else that I enjoy. DB: Steward, it’s always fun hearing from you and we thank you for doing this interview with us. Good luck the rest of the season. Any last words you’d like to share or people you’d like to thank? SBJ: My family for all they have done, my girlfriend, SRT, and KTM for keeping me going.